I created the “Science Through Story” workshop series to offer customized story training for scientists and science educators. I employ techniques adapted from filmmaking, improv, and other art forms to create both storyline and visual media in communications for general or specialized audiences. Over 250 participants engaged in small group and whole-audience discussions at a visual storytelling workshop at UC Berkeley in March 2018. Photo courtesy of Helina Chin, UC Museum of Paleontology. Joined by Character Art Director Matt Nolte (left) and Production Designer Steve Pilcher (center) from Pixar Animation Studios, ElShafie (right) presented a workshop on visual storytelling for science communication at UC Berkeley in March 2018 for an audience of over 250 participants. Photo courtesy of Helina Chin, UC Museum of Paleontology. Over 350 graduate students attended the first Science Through Story workshop at the 2016 Annual Meeting of the Western Society of Naturalists in Monterey, CA. 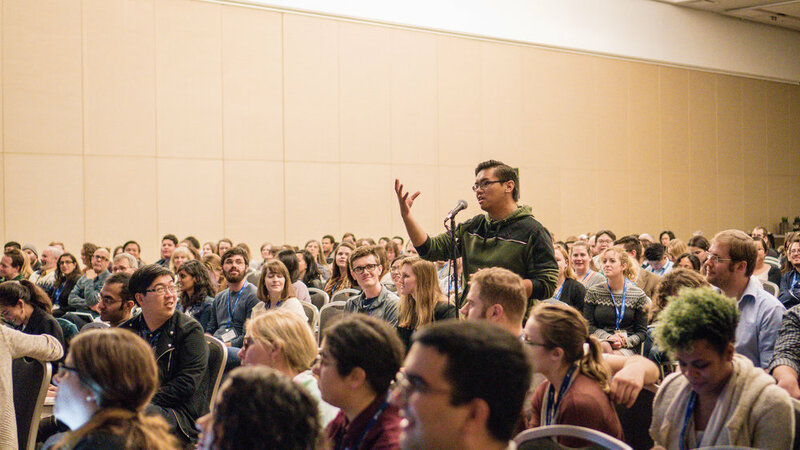 Fellow science communicator Gabriel Santos pitches a science story to a crowd of over 400 participants in a workshop at the 2018 Annual Meeting of the Society for Integrative & Comparative Biology in San Francisco, CA. Photo courtesy of Helina Chin, UC Museum of Paleontology. Throughout the workshop, participants create and share their own stories about scientific research or topics. Participants leave with a treatment for a future presentation or “elevator pitch,” as well as a conceptual framework for future communication opportunities. I have been running these workshops at university campuses, museums, zoos, and conference venues across the continent over the last two years. Workshops have ranged from six to over 400 participants. I also consult on science storytelling and public engagement, including projects for major theme parks and scientific institutions. Photo courtesy of Helina Chin, UC Museum of Paleontology. Sketch notes by Mark Simmons from the 2018 workshop at UC Berkeley on visual storytelling for science communication, presented by ElShafie with Character Art Director Matt Nolte and Production Designer Steve Pilcher, with contributions by K.C. Roeyer, of Pixar Animation Studios. Sketch notes courtesy of Mark Simmons. Pixar content © Disney/Pixar, used here with permission. For inquiries, please contact me. You can also follow updates about future workshops and resources that will be available to the public on the Science Through Story mailing list, and on Twitter (@sci_story) and Facebook.